I started writing for Cooking Channel's blog recently, taking over the Meatless Monday column that goes up at the beginning of each week. While I've been known to consume my fair share of meat (see: barbecue and burgers), this was a welcomed opportunity to make dishes that carnivores may deem dull sound delicious (after all, vegetables are so hot right now). As someone who grew up in a household where there was always a protein or two on the dinner table — except on Chinese New Year, when my family was Buddhist and vegetarian for a day — I've been surprised at how often I'm bookmarking these recipes to try at home. 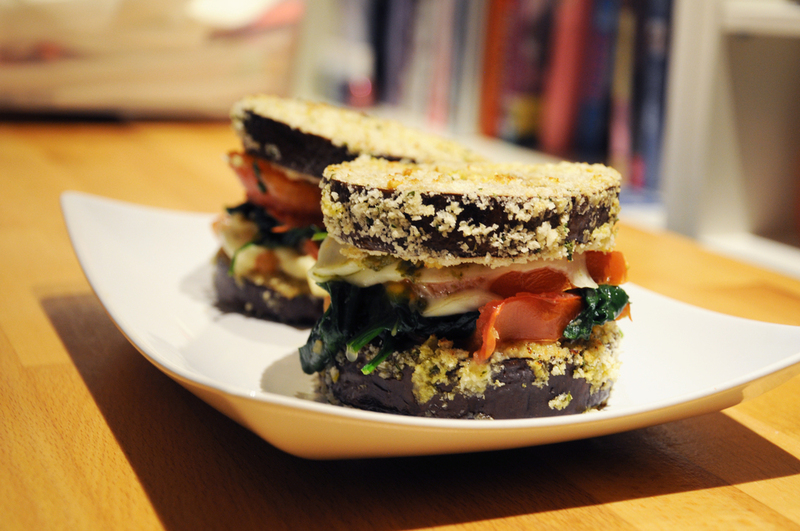 I tore away from this weekend's House of Cards marathon to make my own version of the eggplant stacks featured last Monday, sticking to a handful of ingredients — eggplant, tomatoes, mozzarella, spinach and pesto — and baking the rounds instead of frying them. They were filling, but not too heavy and will definitely be making regular appearances on my dinner rotation. Here are my posts so far, plus a gallery of vegetarian recipes that I edited. Enjoy! Posted in new york city and tagged with vegetarian, eggplant, tacos, salad. February 17, 2014 by Patty Lee.